As we told you earlier this week, the Woodbury County Board of Supervisors met Tuesday night to discuss their weapons policy in light of the new gun laws that take effect this weekend. Thanks in part to your calls and emails, I’m pleased to report that the Council voted 3-1 to overturn their previous ‘Gun Free Zone’ policies! In light of this, Iowa Gun Owners is being FLOODED with calls, emails, and Facebook messages from gun owners wanting to know how they can do the same thing in their community. This email is an attempt to answer those questions and walk you through some of the nuances you have to consider when approaching your County Board of Supervisors. As used in this section, “political subdivision of the state” means a city, county, or township. If a political subdivision of the state, prior to, on, or after July 1, 2017, adopts, makes, enacts, or amends any ordinance, measure, enactment, rule, resolution, motion, or policy regulating the ownership, possession, legal transfer, lawful transportation, registration, or licensing of firearms when the ownership, possession, transfer, transportation, registration, or license is otherwise lawful under the laws of this state, a person adversely affected by the ordinance, measure, enactment, rule, resolution, motion, or policy may file suit in the appropriate court for declaratory and injunctive relief for damages. To summarize: cities and counties in Iowa are considered political subdivisions and, as such, are no longer able to restrict any aspect of the Second Amendment unless the state code has already done the same. Any city or county who violates this section, is now violating Iowa law. This is exactly the point that was made in Sioux City earlier this week by the Board of Supervisors. Chairman Matthew Ung and others stated over and over that they are not doing anything other than following the law, as passed by the legislature and signed by the governor. So when you approach your county leaders, make it clear that you are not asking them to do anything other than follow this revised code section. 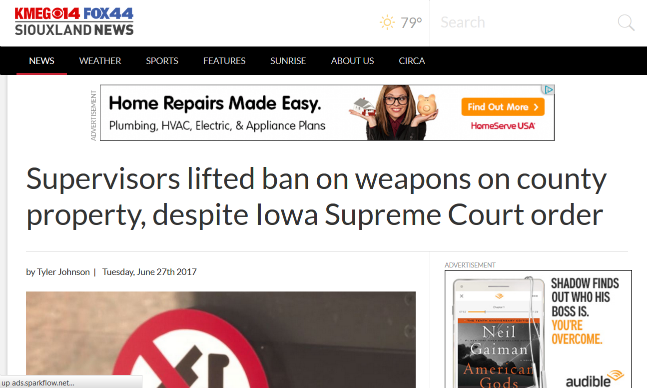 Next, you need to be aware of the fact that your local officials may try to hide behind a recent Iowa State Supreme Court opinion wherein they claimed exclusive control of the County Courthouse and have banned weapons throughout the building. While this may be a new concept for some of you, it is imperative that you understand that the State Supreme Court does not make law here in Iowa. The Legislative authority of this State shall be vested in a General Assembly, which shall consist of a Senate and House of Representatives. The legislature passes laws in conjunction with the Governor, while the court makes legal decisions in light of that law. While they are allowed to rule on a new law’s constitutionality, nowhere does the State Supreme Court have the right to invent new ‘law’ on their own. In this instance, specifically, the Iowa Supreme Court does have the authority in the state constitution (Article 5, Section 4) to ensure the safety and security of courtrooms throughout the state. But nowhere are they granted the authority to claim the entire County Courthouse as their own personal fiefdom. As you all know, Iowans use the County Courthouse on a daily basis to conduct personal business including paying property taxes, registering vehicles, handling driver’s license issues, and much more. These public areas are under the control of your county supervisors, in accordance with the Iowa code. If you are still having trouble with the idea that the Iowa Supreme Court has limits to their power, consider what you would do if they issued an order tomorrow requiring you to turn in your firearms? Of course you would refuse to comply with that order, as you should! After all, you have a natural right to defend yourself that has been further guaranteed in the federal and state constitution as well as codified in state and federal law. But while they do not have the authority to make decisions on the entire building, if your county supervisors do not act, the Supreme Court is going to get away with it! The third thing to be aware of is the political backdrop to this entire situation. The strongest opponent to following the new law in Woodbury County is the County Sheriff, David Drew. Sheriff Drew, like many of his colleagues in the Iowa State Sheriffs’ and Deputies’ Association (ISSDA), were viciously opposed to the passage of Stand-Your-Ground law earlier this year. Sheriff Drew came to the capitol in Des Moines to personally lobby against the bill, and spent much of the spring on local media castigating it. Now that he lost that political fight, he is lashing out by refusing to follow a constitutionally valid law that was passed by the legislature and signed by our then–Governor. We saw the same thing play out here in Iowa with the passage of ‘Shall Issue’ legislation seven years ago. The ISSDA, angry about their losses in the statehouse, tried to make it complicated to get a permit. Whether by raising fees, having inordinate wait times, or trying to require more information on a permit application than they were legally allowed to collect –- it was a difficult process in certain counties. Sadly, it appears that much of this current refusal to abide by Iowa code is more of the same sour grapes. But just like the Supreme Court, the sheriff doesn’t make law here in Iowa. It’s his job to enforce it regardless of how he feels about it personally. That I will faithfully and impartially, to the best of my ability, discharge the duties of the office of Sheriff in XXXX County Iowa, as now or hereafter required by law. ‘As required by law’ -– that’s the standard! Now that Woodbury County has blazed the trail, it is essential that you and I contact our county supervisors and encourage them to follow suit and urge them to do away with their official ‘Gun Free Zone’ policies. To be clear, you are not asking them to take a position on the Second Amendment. As was stated by the supervisors in Sioux City Tuesday night, the political debate over this issue is over — and their job is to simply follow the law. We are hearing from a variety of counties who are in the process of deliberating changes to their policies in light of this new Iowa code, so your immediate action is required! Please contact your County Board of Supervisors and urge them to follow Iowa code and remind them that if they don’t comply by July 1, they are in violation of the law and open to a lawsuit. P.S. Late Tuesday afternoon, the Woodbury County Board of Supervisors voted 3-1 to comply with the new Iowa code, and overturn their current “Gun Free Zone” policies in county buildings. While courtrooms would be off-limits, as they are under the control of the Iowa Supreme Court, law-abiding gun owners are now able to carry in the public portions of these county buildings. With the new law taking effect this weekend, and with Woodbury County blazing the trail, it is imperative that you contact your county supervisors immediately! Insist that they do away with any “Gun Free Zones” that are in effect, to be in compliance with Iowa code 724.28!